Global immunoglobulin market expected to generate around USD 16.6 billion by 2024, at a CAGR of around 7.6% between 2018 and 2024. 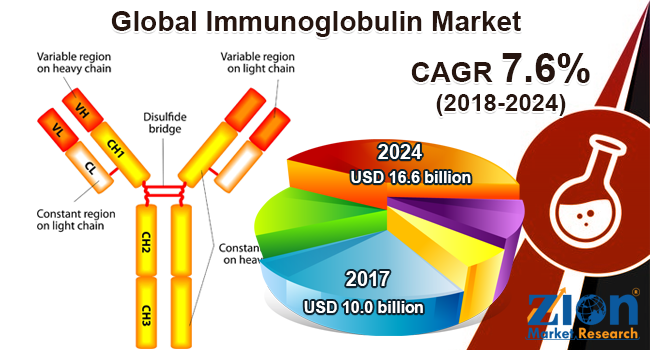 Increasing geriatric population worldwide, steep rise in the cases of neurological disorders, and rising hemophilic patient numbers are likely to drive the global immunoglobulin market in the upcoming years. The report covers a forecast and an analysis of the immunoglobulin market on a global and regional level. The study provides historical data for 2015, 2016, and 2017 along with a forecast from 2018 to 2024 based on revenue (USD Billion). The study includes drivers and restraints for the immunoglobulin market along with the impact they have on the demand over the forecast period. Additionally, the report includes the study of opportunities available in the immunoglobulin market on a global and regional level. In order to give the users of this report a comprehensive view of the immunoglobulin market, we have included a competitive landscape and an analysis of Porter’s Five Forces model for the market. The study encompasses a market attractiveness analysis, wherein all the segments are benchmarked based on their market size, growth rate, and general attractiveness. The report provides company market share analysis to give a broader overview of the key market players. In addition, the report also covers key strategic developments of the market including acquisitions & mergers, new product launch, agreements, partnerships, collaborations & joint ventures, research & development, and regional expansion of major participants involved in the immunoglobulin market on a global and regional basis. The study provides a decisive view of the immunoglobulin market by segmenting the market based on mode of delivery, application, product type, and region. By mode of delivery, the immunoglobulin market is segmented into subcutaneous and intravenous. Subcutaneous is further segmented into 16.5% concentration, 20% concentration, and others. Intravenous is further segmented into 5% concentration, 10% concentration, and others. The application segment includes Hypogammaglobulinemia, Immunodeficiency Disease, Multifocal Motor Neuropathy, Guillain-Barre Syndrome, Myasthenia Gravis, Chronic Inflammatory Demyelinating Polyneuropathy, Idiopathic Thrombocytopenic Purpura, Specific Antibody Deficiency, Inflammatory Myopathies, and others. By product type, this market includes IgA, IgD, IgG, IgE, and IgM. The regional segmentation includes the current and forecast demand for North America, Europe, Asia Pacific, Latin America, and the Middle East and Africa with its further classification into major countries including the U.S., Germany, France, UK, China, Japan, India, and Brazil. Some market players of the global immunoglobulin market are ADMA Biologics, Inc., Shire plc, CSL Behring LLC, China Biologic Products, Inc., Grifols S.A., LFB Biomedicaments S.A., Kedrion S.p.A., Sanquin Plasma Products B.V., and Octapharma AG, among others.